Unhealthy employees cost businesses money, as illustrated by Public Health Institute’s infographic below. Employee obesity and its associated chronic health conditions cost American business $73 billion a year. 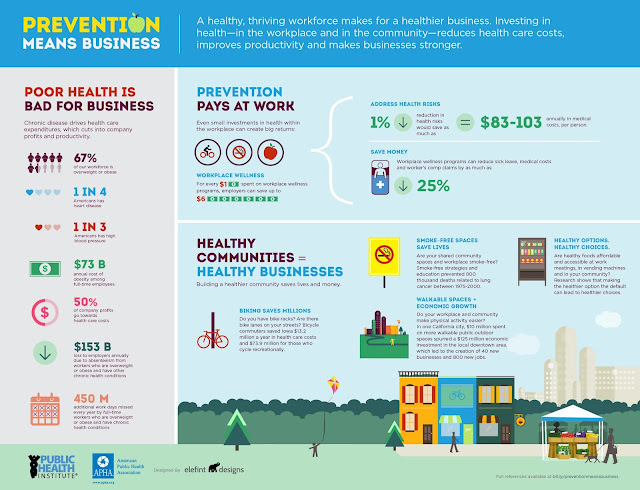 To reduce this amount, many employers have introduced worksite wellness programs to encourage healthy lifestyles in their employees, from healthy vending machines to smoke-free workplaces to exercise programs. Worksite wellness reduces employee sick leave, medical costs, and workers' compensation claims by as much as 25 percent, and saves businesses a bundle.